Sometimes, things are better left unsaid. There are times, however, when people don't think before they speak or are just plain insensitive and go on to say something they simply should not. Below are five things I believe no Scottie Mom should ever be told. Sadly, I have heard every single one of these at least once in the years I've been a Scottie Mom. What are some of the most unusual things someone has told you about your Scottie that you wish you hadn't heard? 5. I know the black one is a Scottish Terrier but what kind of a dog is that one (points to the wheaten Scottie)? It looks so similar to your Scottie dog but surely, it is not one. As Scottie Mom to Heather, I get this question all the time. It has become a somewhat laughable matter and doesn't usually bother me at this point. I just go into autopilot mode and explain that she is, in fact, a Scottie dog, but her color is rather rare. I go on to tell them there are black Scotties, brindle Scotties and wheaten Scotties - that Heather is considered a red wheaten Scottie. A look of bewilderment crosses the person's face and most of the time, they come back around to say how beautiful she is and that they had no idea. Some shake their head in disbelief, saying that she certainly is a mix. And that, my friends, is where they cross the line. Mixed breed or purebred, she is my sweet Heather Beather and I love her just the same so step aside, son! 4. Your dog is fat. Heather hadn't been home for more than a day or two when people stopped by to meet her and that's when it all started. "Wow - she's overweight." Then, it was, "Man, she's BIG!" And my personal favorite: "Well, we know who would win if Mr. K ever put up a fight." Heather is the most lovable dog I've ever known and while she can bowl you over trying to soak up as much of the back scratching and head petting she can get, she is not fat. Heather came to me weighing 27 pounds. Today, she weighs an even 25 pounds and we're watching her to make sure she doesn't lose anymore weight because she is perfect the way she is. Calling a Scottie Mom's fur kid fat is no different than telling a mom her child is fat. It is rude and inconsiderate. Just don't say it. 3. I will never love your Scottie(s) or It's me or the Scottie(s). Pack your bags, pal. Nothing and no one comes before Scottie Love and if you ask us to choose between you and the dog, I can tell you it won't be the dog I'll be giving up. He who loves a Scottie Mom must also love her Scottie dog(s). It is as plain and simple as that. Once you accept a Scottie dog into your life, it is a lifelong commitment until death do you part. I once dated a guy who thought people who posted pictures of their dogs on Facebook were "stupid." Needless to say, that relationship didn't go very far. Can you imagine what he'd say now with Heather and Mr. K stars of their very own Facebook page? It really doesn't matter. Heather and Mr. K are way cooler, anyway! 2. Your Scottie's a jerk! Okay, let's be honest here. Scottish Terriers can be temperamental creatures who definitely possess an air of Scottie-tude about them and can come off as a little rough around the edges sometimes. Mr. K is no exception. However, just because he is selective with his friends (human and furry alike), does not mean he is a jerk. Like individual people, every Scottie is different. Mr. K is actually a sweetheart who protects his own like no other. He is proud and actually is quite sensitive - he just doesn't want everyone to know it. Gotta protect that Scottie pride! 1. You shouldn't rescue. Rescue Scotties come with all sorts of problems. If you really want to get this Scottie Mom's blood boiling, tell me I shouldn't rescue another Scottie. No, I'm not talking about Scottie Dad not being ready to take in a third rescue yet. I'm talking about those who tell me that I should never rescue a Scottie...period. Not realizing both Heather and Mr. K are rescues, I let the foolish people give me their spiel about why one shouldn't rescue (they have mental problems, all sorts of bad behaviors, you just don't know what you're going to get...) before I look at them, smile politely and say, "It's funny you say that. Both of these Scotties are rescues." Then, I watch their jaws fall to the floor - as if that thought had not previously occurred to them beforehand. Someone actually said to me, "...but they're so well-behaved!" Yes. Heather and Mr. K are well-behaved but what makes you think other rescue Scotties are not? All it takes is a little patience and a lot of Scottie Love, people! Yep, just mention any of those to Mom or Dad and the war is on, Yes we are stubborn, family orientated, and protective of our stuffs, peeps and homes.Now Bites is the nut that thinks everyone came by to see him, loves to rough hose with Dad. ME, I am a true MAD Scot, own the yard, love my peeps (but hate other people, the puppy mill was very abusive) GOTTA sleep on the bed sideways, so yes we ARE VERY independent, but that's a Scottie-tute Scottie. Love us as we are! A lot of people are rude. A lot more are just plain ignorant. I’m with you. NOBODY messes with our kids! And the only one who’s allowed to comment on Bonnie’s weight is me! Bravo! Well, said! My peep actually had someone tell her I wasn't a Scottie! We laugh every time someone says "your westie needs a bath". People sure do make some silly comments! 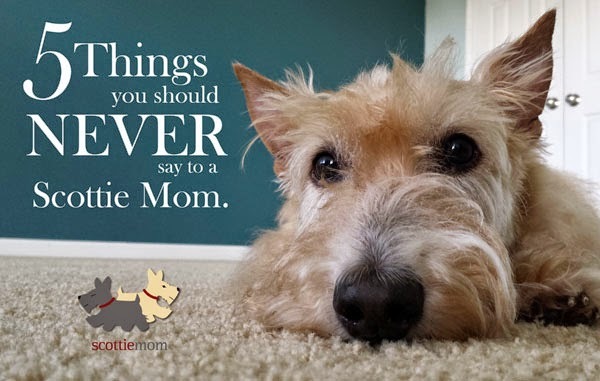 Oh boy, we so totally get it...replace Scottie with Lhasa mix, and that's our Mama! Don't Diss Our dogs!! Someone thought Daisy and I, Bella, were Yorkshire terriers once! Scotties aren't everyone's cup of tea, but you don't have to say anything. I love some of the comments He made when Kenzie the Westie and I were the dogs in the pack. Q. Are they the same breed? A. Not only that they're identical twins. Q. Are those calm dogs? A. Definitely, they're calm when they're not bouncing off the walls. My first childhood dog was a Scotty mix. Cinders. I got my love for dogs from him. First thing I did when I got a house was get a dog. Cinders started all that for me. #5. I get this all the time about my Marley. They say she is such a pretty Westie. I mean Really? Scottie's look nothing like a Westie. #4. Our Chaplin is 38 pounds of Muscle. When he runs its like a Hover Craft. He's not fat. Just a BIg Scot. #3. This is simple. My Scotties come first, my Husband is way ok with that (like he has a choice) they come first with him as well. I have three Scotties and one that I get all the time from peoplpe standing with thier children, that isnt listed is. "Which one is your favorite" I turn the question around and ask them "Which one is your favorite" Then they realize that just ask a stupid question. #2. Our Maddie was Queen Bee and could dimiss people with the best of them. She was like a queen that would let her followers touch the hem of her gown as she passed by, and that was the lucky ones. She would simply walk away as if she was saying "you have been dismissed" I loved this the most about her. She demanded respect and always receive it. Yep we hear it all. Last weekend I was at a street fair and a women came up to me and said Scotties you can never house train. Well I have had three scots and all were house broken very fast. And if another dog comes into the house and has an accident my scots would tell on them in a second. All three of mine have been loving to everybody including kids. But I myself sometimes call kids rug rats being I know one person who have never tained her kids. Mom's favorite is.....drum roll please.... your dog is a snob. She says only to you maybe. Number 4 all the way!!!! I can't believe anybody would say these things to you! Really. OK, the ignorance about the color I get, but not the other stuff. Neither of your dogs is fat. And even if they were, it's nobody's business. People are unkind and thoughtless. Whenever people call me a skunk because of my markings, my peep says it's unkind and not nice and "you wouldn't want me to say that about your child would you?" We have been married for over 40 years and have always had Scotties in our lives. They are all so different. Once a friend (who has Scottish ancestry) ; he visited us alone in CT but is from the Bay Area. He had just had his fifth child and also decided to get a scottie puppy!! Well that did not turn our well. Some people need to understand that Scotties are not labs!! They need to be puppies when there is not a baby or little kids around who might also need Mom and Dad's attention. But given the right people and a firm training (just as I did my daughter)..they are just the best breed in the world. When I was expecting my daughter and after we treated our first Scottie just as you would any sibling who is welcoming a new member into the family. I must confess I was quite reluctant to get a Wheaten Scottie..also thinking that it might be different than a "real scottie". Obviously they are sooo Scottie and as different from one another as all Scotties usually are--each one has its own unique personality along with the Scottitude characteristics. When we took our rescue Junie and she kept commenting that she was fat I snapped and said "ya know, I would rather her be fat instead of a starving bag of bones. And she also commented that she was extremely shy. I had to also say.. well, if you were cooped up in a cage all day and ignored, you would be too'. I shut our Vet up real fast. We have had Junie for 5 years now and she has lost some weight and come out of she shell some. But no matter what she is my baby and she is loved just as much as our other 2 Scotties. Whoever came up with this list I would like to take in the back alley. My last two Scotties were rescues. I would love a puppy but that won't happen. The love from a rescue is nothing there is. My current one bonded with me the moment I picked her up. She spent her first two years in a extremely bad puppy and missed her puppyhood and don't know a lot of things like giving kisses. Her love for me is so deep. She is extremely smart. She has her problems but if I went through what she has I would have problems too. We just work through them. I wouldn't give her up for all the money in the world. We will always be together forever. I will be buried with all my Scotties. As long as I live I will have a Scotty from a rescue. I would have more but Bonnie is not receptive. I could have six. There is no other breed than a Scotty. Our Duffy is the best dog I have ever had the pleasure of knowing and he's a rescue! Our other Scottie, Bonnie Jean, (now passed) was a little crazy. She came from a breeder and was very high stung but a beautiful Scottie! We were vendors at Arlington Texas Scottish Festival years ago when a lady wandered into our tent. She saw our Hamish asleep at my feet and asked if we ever allowed him to stud. I replied we didn't do that that all of our dogs were fixed. As she walked away, she said our Yorke and YOURS would make such cute puppies. I took a deep breath and said, our dog is not a yorkie, he is a scottie! And this woman then said, well, I don't see any difference! I still wonder if she really owned a scottie and thought it was a yorkie, or she was just a nutcase! A well meaning person of faith smiled sadly at my rescue scottie senior and said; "It is too bad they do not have a soul". Implying I was wasting my time on something with the same worth as a garden tomato ... I did not bite her myself. People are mean - or just thoughtless. I have a Scottie, a King charles Cavalier and recently just lost my westie 6 weeks ago. I was thinking of getting another Cavalier and was talking to a breeder. She asked me what kind of dogs I had. I told her and told her I recently just lost my beloved westie of 12 years and I was shocked/appauled by her comment "Oh I don’t like those dogs". It actually hurt my feelings. I thought your not a nice person. I just told you I lost my dog and you say that? I quickly just got off of the phone with her and thought I wouldn't consider getting a puppy from a person like her !